Suitably refreshed, we began with Dr Stefan Bergh (Dept of Archaeology, NUI Galway) who delivered the paper: Meeting at the edge – Turlough Hill as a place of prehistoric assembly. 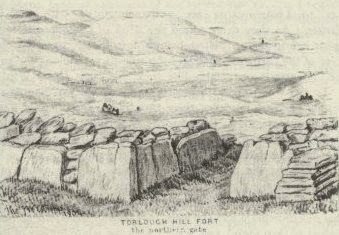 Bergh argued that many sites were the foci of gatherings, such as megalithic tombs and the like. However, many gatherings would have been held at sites that leave no obvious traces, such as a cliff, a tree, or a waterfall. Our challenge in these instances is to understand the ‘place making process’. One important focus in this endeavour is to understand how people perceive landscape. There is an interplay between people and landscape that Bergh sees, not just in terms of the creation of monuments, but in their daily lives. These mental and physical landscapes play significant roles in the creation of belief systems. Mountains have long been seen as ‘special’ places, not just in terms of safety and defence, but as the foci for belief systems. One of the reasons for their specialness is that they symbolise the capacity to bridge earth and heaven and allow entry to what lies beyond the physical world. In some cultures the most important spot is the summit, which is the focus of religious ritual, while in other instances the focus is on the verticality of the mountain. In some places, the mountain is not climbed, but venerated from afar (e.g. Mt Kailash in Tibet), while in others, the act of climbing is itself part of the ritual (e.g. Croagh Patrick, Co. Mayo). In Ireland, the uplands have been actively used from prehistory to Medieval times. While some of these uses have been political and social (defence and domestic), others have been imbued with religious significance. Bergh argues that The Burren is a physical boundary between county Clare and the lowlands of south Galway. To anyone approaching from this direction it appears as a gigantic grey wall. At Turlough Hill the archaeological remains include a large cairn and house foundations on the western summit and a large enclosure on the eastern summit. This latter enclosure is roughly hexagonal and measures c.220m across. Berg points out that it is clearly not a defensive structure as it has over ten defined entrances and is, in any event, merely composed of a low bank. Thomas Johnson Westropp, when writing about this site in the early 20th century, described it as a temple rather than a domestic rath/ringfort or cashel. The cairn on the western summit still retains some evidence of vertical walling, but has never been excavated to comprehensively determine date and function. The same area also holds 156 identified houses. These occur in clusters of three to four examples, but are not evenly distributed across the summit – they appear to occur at both ends of the summit and near the central area. There appears to be no topographical reason for these intervening blank areas, However (if I understood Bergh correctly) one of these supposed ‘blanks’ has recently shown to contain an enclosure composed of four low, concentric banks. In the saddle between Turlough Hill’s twin peaks there is a long cairn (c.95m x c.6m) that includes at least one megalithic chamber. In many respects, the site may be paralleled with Mullaghfarna, Co. Sligo, where survey has recorded 153 houses of Neolithic and Bronze Age dates. Bergh suggests that the morphology of the cairn and the houses at Turlough Hill suggests a similarly Bronze Age to Neolithic date. 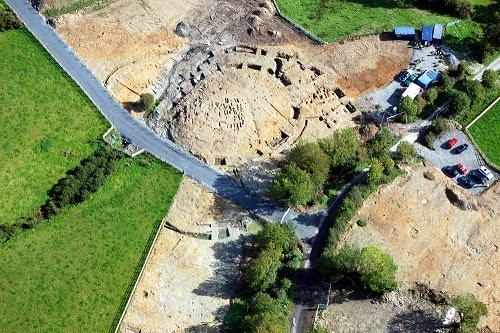 The hexagonal enclosure is unique within Irish archaeology, but it may well be of a similar age. Bergh is at pains to point out that this is not ‘just another hill top’. The houses have no parallels within the Burren area. They are not ordinary prehistoric farmsteads. As there is no apparent overlapping of developments, he argues that they represent a single, concerted phase of deliberately planned building. He believes that they were not domestic in function as the hill was not easily accessible and was generally inhospitable. On a personal note, I can very much agree with Bergh’s thinking on this last point. In my days as a Boy Scout, our troop (4th Galway Craughwell) was often to be found wandering through various parts of the Burren. On one large-scale camping weekend event (known as a 'Sionnach Adventure') I, as a senior Scout, was given the job of maintaining a safety checkpoint for the groups as they passed over Turlough Hill. I set up my checkpoint in the lee of what I now know to be the large, kerbed cairn and with several hours to kill, I set about reading Isaac Asimov’s I, Robot (why that particular detail remains so clear after all these years, I have no idea!). It was early summer and the sky was remarkably clear and the sun was warm – very warm. I remember that, despite having come well-prepared, I was soon out of water and was reduced to begging small amounts from the groups as they passed through the checkpoint. There was no easily available water for some distance – both horizontally and vertically. While the sun shone and the breeze was low it was a very pleasant place to be – so long as you were well provisioned. At around the same time in my life – and as part of my Boy Scout adventures – I have been on Turlough Hill on a number of wintery evenings as it got dark and the wind picked up and the rain came down. On these occasions it was not quite as charming as one was alternately soaked and buffeted. Whatever about my childhood observations of the place, Bergh argues that the location was used by two groups coming together. Turlough Hill is on the very edge of the Burren and Bergh suggests that this liminal location was one where the local people could have met outsiders. Whatever role the site played, the surviving remains are without counterpart and, he argues, has important significance for the people of the area and beyond. Under the same night sky - the architecture and meaning of Bronze Age stone circles in mid-Ulster was the topic of Michael Mac Donagh’s (National Roads Authority) presentation. He began with the broad statement that he was going to present a pretty odd take on these sites and that he’d be happy if even one person came away thinking that there was some merit in his theory. With this idea of impending controversy hanging like tantalising bait before us, he began to set the scene: stone circles as a whole, are architecturally very varied and of a wide variety of dates. Together, these facts may be taken to suggest that they also had a similarly wide variety of uses. The mid-Ulster group of stone circles comprises over 100 examples. 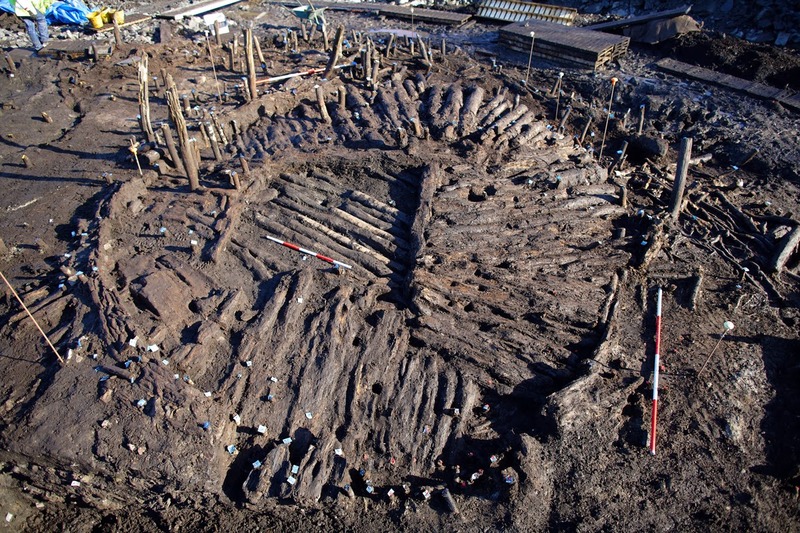 Where they have been investigated, they appear to have become overgrown with blanket peat around 800 BC, so would appear to be of Bronze Age date. Two of the most important of these complexes are to be found at Copney (Foley 1983; 2010; Foley & McDonagh 1998; MacDonagh 1998) and Beaghmore (Pilcher 1969; 1975; Thom 1980; Hayes 1999), both in Co. Tyrone. These are, for the most part, made up of small, low-set, stones and arranged in groups of more than one circle. Mac Donagh argues that it’s not fanciful to assume that there was a design to their layout. At Beaghmore the design is dominated by five circles and various double-row alignments. Copney was discovered in 1982 and was partially stripped and excavated in 1994 and 1997. At that time three of nine circles (A-C) were wholly or partly exposed. Further work in 1998 – that I was lucky enough to dig on [photo: here] – uncovered two further circles in the complex (J & K). 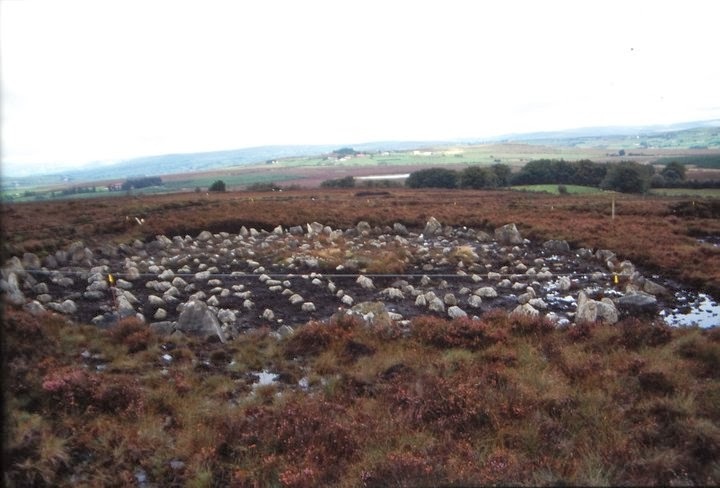 Mac Donagh made the case that at Beaghmore Circles A and B are circular, so it is clear that the people of Bronze Age Tyrone were able to produce circular circles if they so wanted. However, Circle C is not perfectly circular and, rather than see it as an aberration or a failure in ancient technology, he asks if this is not evidence of a deliberate action? There is a similar lack of circularity at Copney and Mac Donagh asks if these are not evidence that these circles were designed in this way? At both sites the circles are laid out with two circles together and a third at a distance. The same layout is also visible at the Tremoge stone circles (which I also dug on in 1998 [photo: here | here | here] … though I didn’t consider myself quite so lucky … it was a horrible waterlogged, nasty site … and the locals broke in to our site hut and stole our tools and kettle … and pushed the portable toilet over). Mac Donagh suggests that the same pattern may possibly also occur at the Culvacullion stone circles too. He argues that between all these sites there is evidence for a ‘Grand Design’ template. The tricky question is: what is the origin of that template? Mac Donagh notes that there is a long-established framework that sees the sites (the paired stone rows in particular) as linked to the observation of the heavens on key dates. Little attention has been paid to the layout of the multi-circle complexes themselves. Mac Donagh has co-opted the assistance of two nine-year-old girls to produce drawings of the moon. Even at this young age, and using only the naked eye, they can perceive and depict ‘globularity’ in the ‘face’ of the moon. Personally, I’m deeply suspicious of any attempt to reflect the thoughts and actions of ancient peoples in the thoughts and actions of ‘pure’ and ‘untutored’ modern children. Nonetheless, Mac Donagh’s point is well made – the non-circularity of the lunar maria are observable even to young children, not predisposed or (we must suppose) pre-instructed on the topic. Indeed, under the correct conditions, the features of the moon are clearer still. For example, at the times of a perigee moon (or ‘Supermoon’) our natural satellite is up to 50km closer than usual. Under these conditions, the moon appears 14% larger and 30% brighter than one at its farthest point, or apogee. Mac Donagh urges us to shed the notions of astronomical accuracy, and instead view the creators of these places as ‘ritual artists’. Going back to the early written record, Plutarch’s (c.46-120AD) On the Face in the Moon's Orb noted the existence of the lunar maria. In the same work he describes the moon as ‘the finest and clearest of all mirrors’. The Wikipedia article on the exploration of the moon notes that prior to this time ‘It had been suggested already in antiquity that the Moon was a perfect mirror and that its markings were reflections of earthly features’. Mac Donagh notes that the mathematician, astronomer, and philosopher ibn al-Haytham (c.965-c.1040) wrote of the moon as a mirror; as did Alexander von Humboldt (1769-1859). This is obviously a theory of remarkable longevity. Could it have been the same going further back into prehistory? Did the people of Bronze Age Tyrone see the moon as a reflected image of the earth? If they did, it may demonstrate a commonality of shared beliefs across wide geographical and temporal arenas. Having shown a broadly similar ‘template’ could be posited for many of these sites, he attempted to argue that these were inverted human representations of the lunar maria. He takes the position that Beaghmore (the best preserved and most thoroughly uncovered of all the sites) may be interpreted in this way … though there would still be the need to find two additional circles in the unexplored peat land. Mac Donagh continued on in this vein for a while longer, but I’d given up taking notes. I’d come to feel that it was a lovely little theory and a great conference paper, but that it had more to do with Michael’s ability to draw together disparate strands of evidence and pseudo-evidence, weaving them into an (apparently) robust argument. However, the hypothesis was as flimsy as moonlight and, no matter how interesting and comedic the delivery, it was no more than nonsense. This wasn’t archaeology. I was not convinced. And yet … I couldn’t get the idea out of my head … I’ve been thinking about this for over three months now and, while I’m still convinced that he’s wrong in areas, I’m beginning to see that his ideas do have merit. It appears that I have fallen prey to this idea – I’m the one in the audience who came away thinking there was something in the theory! Let it sink in and ruminate on it a while … maybe you too will be seduced by Mac Donagh’s ‘lunacy’. Note: this paper is based on the recently published paper: McDonagh, M. 2014 ‘Under the Same Night Sky – The Architecture and Meaning of Bronze Age Stone Circles in Mid-Ulster’ in Ginn, V., Enlander, R., & Crozier, R. (Eds) Exploring Prehistoric Identity in Europe: Our Construct or Theirs? Oxford. The last paper of the day was Gathering the Nations: Kingdoms, Communities and Civil Society in Early Medieval Ireland by Patrick Gleeson (UCC). He started by outlining the idea that, within Early Medieval Ireland, the hierarchical nature of kingship demanded that different societal layers and scales had their own tailored landscapes of assembly. On this basis, we may infer that there was anything from a minimum of 200-600, and up to a maximum of 1500-2000, different assembly spaces at any one time during this period. Of these, the most important was the Óenach. 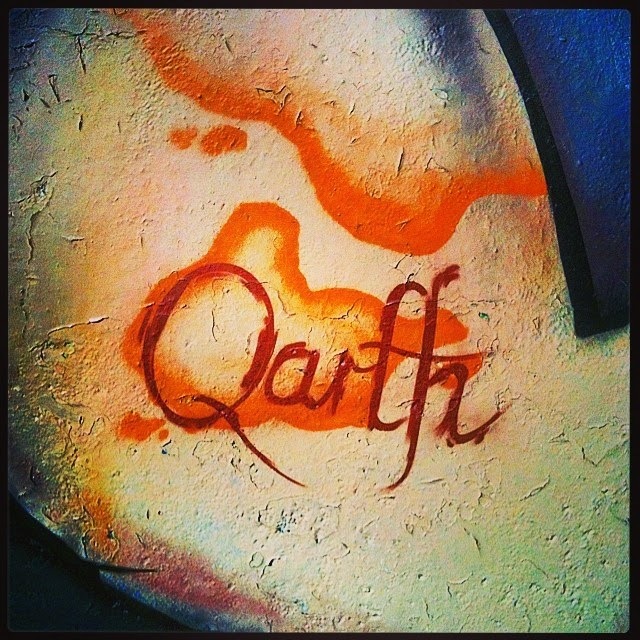 The word derives from óen, meaning ‘one’ and is today most associated with markets or fairs. However, during the Early Medieval period it was a place and an occasion for rendering tribute and included horse-racing, games of various kinds, feasting, and entertainment, along with holding numerous legal and judicial aspects. It is the association of the Óenach with these latter functions that placed this form of gathering at the centre of contemporary civil society. Despite their importance, and presumed ubiquity, relatively few Óenach landscapes have been identified. To address this imbalance, The Óenach Project was established at UCC, and funded by an IRCHSS New Ideas grant. The project is dedicated to the research of the origin, nature, and evolution of assembly practices and previously unidentified gathering sites. So far, some 115 Óenach sites have been identified. Examples include Carrigatogher (Harding), Co. Tipperary, and the Kilmainham complex, Co. Meath, the latter including a boundary ditch dated to the Iron Age. At Holdenstown 1, Co. Kilkenny, Iron Age ring ditches were reused in the Early Christian period. Emerging trends from this research include the observation that the boundaries of túatha (singular: túath) were frequently marked with ogham stones and human burials. Of particular interest was Gleeson’s argument that assembly sites at the túath level may be identified at cemetery settlements, indicating a kingly control of burial within society at this time. All together, Gleeson – in a paper that was remarkably dense and delivered at Gatling-gun speed – demonstrated that this form of targeted multi-discipline research can pay huge dividends and help develop a wider appreciation of these Óenach landscapes. After a group question and answer session, the conference closed for the evening and the delegates retreated to the Glasshouse Hotel for what turned out to be a sumptuous conference dinner. Foley, C. 1983 ‘A stone circle complex at Copney Hill, County Tyrone’ Ulster Journal of Archaeology 46 (3rd Series), 146-148. Foley, C. 2010 ‘Public space and architecture: the phenomenon of Copney stone circles’ in Murray, E. & Logue, P. 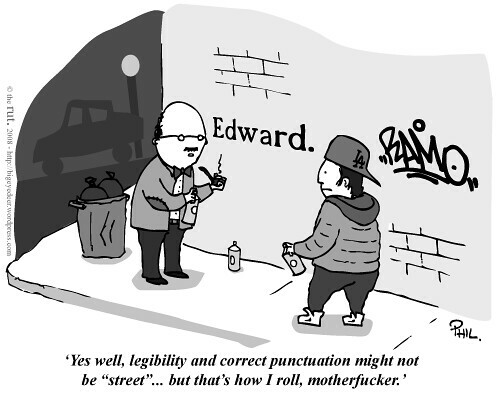 (eds.) 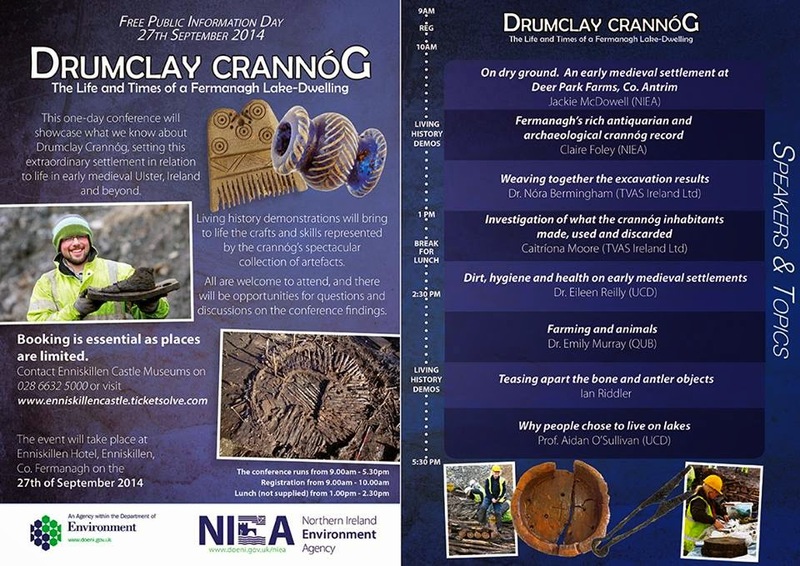 Battles, boats & bones: archaeological discoveries in Northern Ireland 1987-2008. Belfast, 28-31. Foley, C. & McDonagh, M. 1998 ‘Copney stone circles - a County Tyrone enigma’ Archaeology Ireland 12.1, 24-28. Hayes, T. D. 1999 ‘Using astronomy in archaeology with a look at the Beaghmore alignments’ Ulster Journal of Archaeology 58 (3rd Series), 32-42. MacDonagh, M. 1998 ‘Abstract: under the bog at Copney’ IAPA Newsletter 26, 9. Pilcher, J. R. 1969 ‘Archaeology, palaeoecology, and 14C dating of the Beaghmore stone circle site’ Ulster Journal of Archaeology 32 (3rd Series), 73-91. Pilcher, J. R. 1975 ‘Finds at Beaghmore stone circles, 1971 and 1972’ Ulster Journal of Archaeology 38 (3rd Series), 83-84. 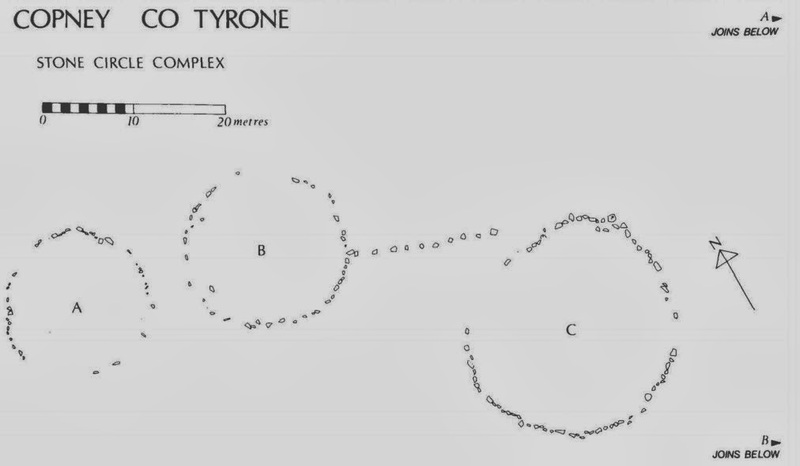 Thom, A. S. 1980 ‘The stone rings of Beaghmore: geometry and astronomy’ Ulster Journal of Archaeology 43 (3rd Series), 15-19. Suitably refreshed, entertained and educated by Simon O’Dwyer, [Website | Facebook | Twitter | LinkedIn | SoundCloud | YouTube] we reassembled for the first afternoon session, again chaired by Sam Moore. This portion of the conference began with Prof. Clark McPhail (University of Illinois, Urbana-Champaign). Prof. McPhail was also the Keynote Speaker (Sociology) for the conference. His chosen topic was The Life Course of Temporary Gatherings. His first observation was that archaeologists appear to prefer the term ‘gathering’, as opposed to the word ‘crowd’, which is preferred by sociologists. He then took us through a collection of his photographs from the period from 1965 to 1968, chronicling the Civil Rights, Anti-Vietnam War, and Labor Movements in the US. He described how his early work was about taking photographs and making notes. He was recording these crowds, but there was no defined methodology. At that time there were various theories on crowds and collective behaviour. However, none of the theories specified any behaviour, nor were there criteria in place to judge the behaviours of the collective. Prof. McPhail argued that the concept of the crowd implied homogeneity of motives, goals, and attitude. He proposed that a better definition of a ‘gathering’ is needed. His answer was: Two or more persons, occupying a common location in space and time. Going beyond this, there are various forms of gathering, including Continuous (e.g. prisons, military bases, encampments); Temporary (e.g. political rallies, parties, workspaces); Impromptu (e.g. fires, arrests, fights); Ad hoc (e.g. funerals, demonstrations); Periodic (Hajj, sporting events). What all of these have in common is that they require an action of assembly to form the gathering, followed by an eventual dispersal process. 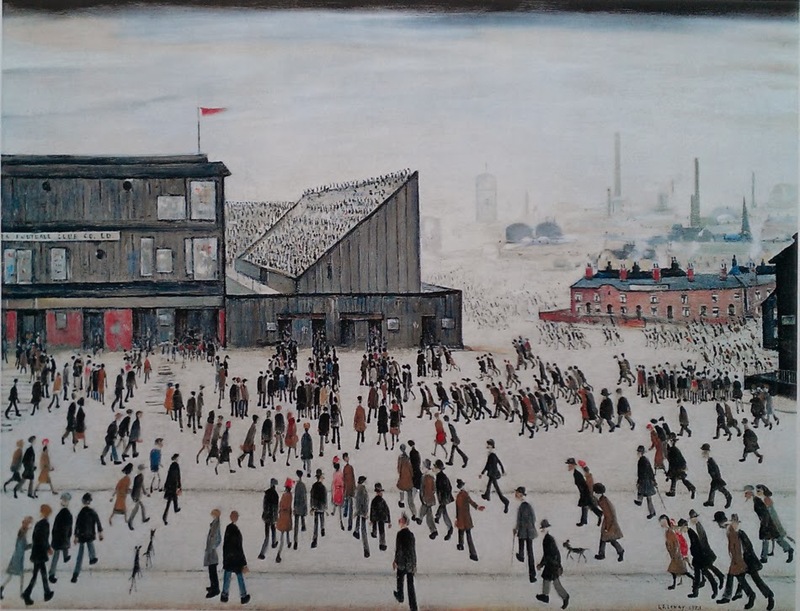 Using L. S. Lowry’s painting 'Going to the Match' as a visual aid, McPhail noted that while one can spot some individuals within the crowd, most are in small groups. His research has confirmed this pattern – that people assemble, engage, and disperse form these large gatherings as small groups. The dispersal process may be in one of a number of forms: Routine (the process is self-initiated; gradual; uneventful); Coerced (the process is other-directed; physical; there may be injuries sustained from, for example, pepper spray or hoses/water cannon); or Emergency (this form suggests altruistic behaviour). All gatherings are comprised of an alternating and varied combination of individual and collective actions. McPhail’s research shows that these may be broken down into a number of components: Facing (convergent facing – e.g. towards a stage or speaker); Voicing (e.g. chanting or singing); Manipulating (e.g. hands in air/clapping/gesturing (pointing, single-finger salute etc. )); Posturing and Locomotion (e.g. sitting/embracing/SleepingDragons/prostrating (islamic prayers etc. ), walking, or marching). Researchers use field notes, photography, and video to identify and record how two or more individuals can interact in a crowd. Prof. McPhail’s work shows that there are some 40 elementary forms of collective action (EFCA), in terms of stances and/or interactions. Prof. McPhail and his associates have applied their process to over 150 gatherings, including the March for Life; the National Organization for Women; and the Promise Keepers’ Stand in the Gap: A Sacred Assembly of Men event at the National Mall in Washington, D.C. in 1997. In the latter case, operatives recorded 55 ‘observation minutes’ between 10am and 7pm, which included two hours before and after the event. Recording at this level of granularity allows ‘quantitate estimates of the proportions of persons in a gathering participating in one or more EFCA over time and hence a window into the dynamics of collective actions within gatherings’. McPhail argues that, although there are a number of caveats, the idea of unanimity is an illusion within group dynamics – everyone is not always doing the same thing and there is no mutually inclusive form of participation. He ended with a call for further research to produce a more general theory of purposeful action. If this conference had awarded prizes – and it should have! – for most co-authors of a single paper Tonight we’re going party like it’s 1985! The Archaeology of Festivals in Geophysical Data would have won hands down [edit: actually we’d have had to share the prize, but there should still have been a prize!]. Dr. James Bonsall (University of Bradford, Earthsound Archaeological Geophysics) took the floor representing himself and the following: Dr. Chris Gaffney (University of Bradford); Prof. Vince Gaffney (University of Birmingham); Heather Gimson (University of Bradford, Earthsound Archaeological Geophysics), and some bloke called Robert M. Chapple (William Dunlop Archaeological Photographic Archive, Irish Radiocarbon & Dendrochronological Dates). 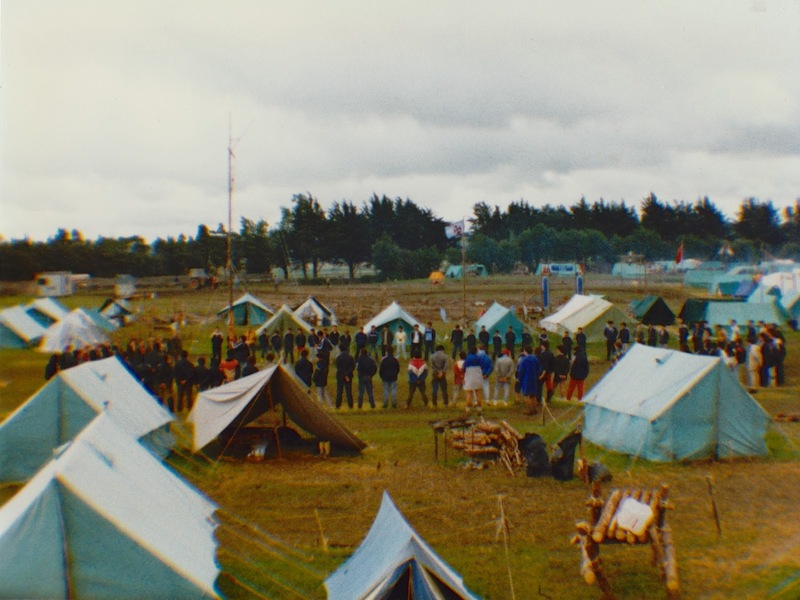 Bonsall began by outlining the two 1985 festivals that involved the gathering of large numbers of people that made up the paper – In the vicinity of Stonehenge there was gathering of Hippies, while in Portumna, Co. Galway, there was a Scout Jamboree. From a geophysical point of view, both forms of gathering created settlement activities that produced areas of burning, ferrous debris, and dug features such as latrine pits. The Stonehenge Hidden Landscapes Project (SHLP) has carried out fluxgate gradiometery over 8km2 surrounding the central monument along with high resolution magnetometry (caesium vapour) over a smaller area. The Stonehenge landscape had long been known to have been the focus of gatherings during the Neolithic and later periods. The data collected by the SHLP during 2010-2012 has allowed the identification of several previously unrecorded prehistoric monuments, including new barrows and hengiform enclosures, which emphasise the importance of the landscape surrounding Stonehenge. A large area of dispersed ferrous debris was recorded during this work and has been identified as the remains of the Stonehenge Free Festival. The festival was held at this location from 1972 to 1984, and was attended by up to 65,000 people. The final (attempted) festival resulted in a confrontation with the Police on June 1st 1985, known as ‘The Battle of the Beanfield’. Documentary evidence indicates that there were a number of discrete areas dedicated to the stage, campsite, latrines, and basic supplies. Potentially confusing factors include tales of a tax being levied by the organisers to fund a post-festival clean-up, though it is uncertain how effective either the clean-up or the attempt to levy it actually was. Surviving maps of the festival layout were overlain onto the geophysical data – itself arranged by 1 hectare blocks. The geophysical data clearly shows that the campsite was differentiated by a high volume of ferrous signals, and the position of the latrines may also have been identified – at a slight remove from the rest of the activities. The geophysical investigation at Portumna, on the northern shores of Lough Derg, Co. Galway, was commissioned by the Office of Public Works. The site includes a 13th century Cistercian Abbey, a Medieval castle, a post-Medieval icehouse, and assorted late buildings. The geophysical methods used here included magnetometer surveys, along with ground penetrating radar, and earth resistance. The Portumna data also returned a similar pattern of material remains, suggested by increased background noise in the data. This is interpreted as evidence of the August 1985 Scout Jamboree that attracted 10,000 scouts and their leaders from around the world. This was my personal contribution to the paper, having been one of the Scouts attending the event – I was a member of Kestrel Patrol in the 4th Galway, Craughwell, Troop – and could contribute personal reminiscences of the event. For the first time in my life, I have been less the archaeologist, and more the archaeology! The surveyed area covered the Grainne Staff Camp and part of the open area in front of the stage. 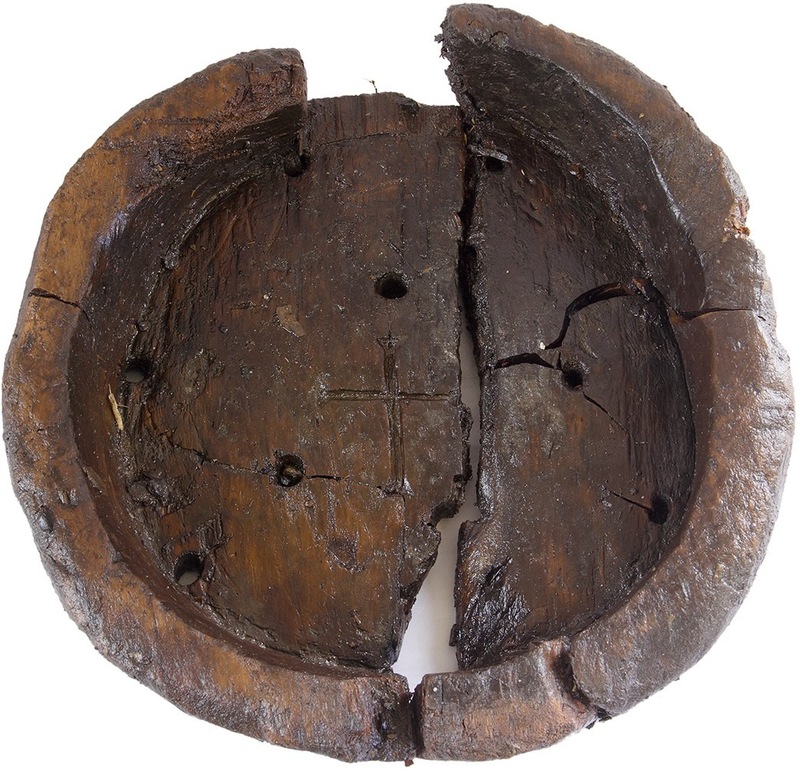 One difference between the two datasets was the lack of burning evidence at Portumna, which may be explained by the camp requirement of having a raised-hearth, so no dug fire-pits were excavated. Again, the communal area around the stage was kept clear, which was reflected in the geophysical data. Bonsall’s point in all this is that we have here two relatively well documented gatherings that have left no surface trace, but yet may be recovered through geophysical survey. Consequently, there are implications that other gatherings, much further back in time, could be identified through careful analysis of the data from future surveys. With regard to these festival sites in particular, Bonsall asked if they could be considered archaeological sites in their own right? As the current Irish legislation is framed to only include post-1700 AD sites, this is not an option. 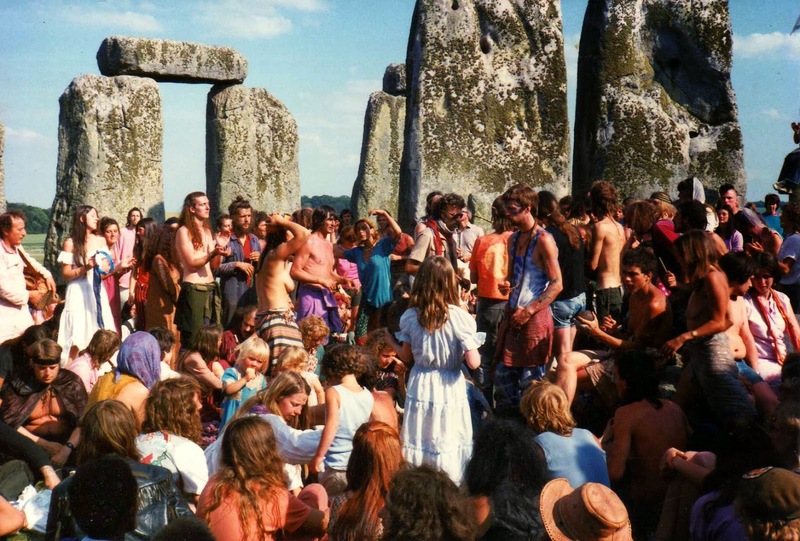 However, the UK ’50 year rule’ will mean that the site of the first Stonehenge Free Festival in 1972 will officially become ‘archaeology’ in 2022. Some commentators have suggested that the ferrous signals should be investigated, with a view to ‘decontaminating’ the Stonehenge area. Bonsall argued that this would lead to large-scale test-pitting across the landscape that would be needlessly destructive to the ancient sites. He also pointed out that the presence of the festival can be interpreted from the aggregation of the ferrous responses, but that not all are certainly of modern origin. My own feeling in this is that these festivals are part of the story of these sites and that archaeological record should be left in place. The final speaker in this session was the Dr Edel Bhreathnach (Discovery Programme) speaking on Medieval Gatherings. I’m ashamed to admit it, but there were large parts of this presentation that I just didn’t get. This is no fault of Bhreathnach, who is an excellent and engaging speaker, but more to do with my lack of familiarity with much of the source material and my parallel need for caffeination – by this time in the afternoon the lecture hall felt too warm and airless, and I struggled to maintain any form of concentration and coherent note taking. For these reasons, I present merely a couple of ‘snippets’, rather than a more complete account of her paper. Bhreathnach began by noting that there are a small central core of sites that are regularly referred to in the early sources as places of gathering, including Rathcroghan and Telltown. However, there must have been a whole host of local and regional gatherings. Certainly, there a large number of Irish terms for various forms of gathering. These include Óenach (a fair); dál and comdál (organised, royal events); tinól (ecclesiastical); cuairt (Lordly or legal); and airecht (a local assembly). Bhreathnach examined the purpose, period, context, attendees, and the type of sites employed for these gatherings. The Annals of Ulster record that in the year 1007 the Óenach of Telltown was revived by Maeloachlin, a rival of Brian Boru, who also wanted to be king. This was expressly part of his bid to be seen as suitably kingly – essentially creating/recreating a place to hold a gathering was a necessary point of kingship. In every sense this was a ‘staged’ event with the burial sites and standing stones associated with the site being regarded by Bhreathnach as ‘props’ for this large-scale production. There is also evidence that earlier monuments were reconstructed and sculpted as part of these revivals. For example she points to evidence from John Waddell’s work at Rathcroghan and the Conor Newman’s excavations at The Knockans, part of the Telltown complex. Bhreathnach noted that there was an intriguing recurring theme in the literature of these sites being associated with the death of a female figure. Such recurring instances can be easily dismissed as literary motifs, but she noted that as part of her work on the Mapping Death project there did appear to be a correlation with the use of female burials as the central or ‘foundation’ burials in cemetery groups or as burials on territorial boundaries. 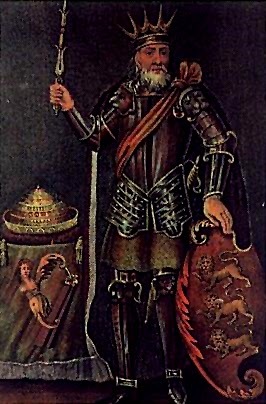 In the period from 1118 to 1156 Toirdelbach Ua Conchobair, King of Connaught, held a number of gatherings. Some were held at ancient sites, but some were not. An analysis of their form indicates that a wide range of places were considered as suitable, and were used, for assemblies. Bhreathnach argues that we must be careful in attempting to find a ‘one size fits all’ definition of what constitutes a suitable assembly site. Instead, we should be cognisant of the fact that differences in statuses of the various participants, along with the reasons the assemblies were held, had a direct bearing on the places chosen for gathering. With the conclusion of a brief question and answer session with the speakers, we all ambled out into the light for fresh air and coffee. Attendance is free, but places are limited and booking is essential. Book here. I’m really looking forward to this & I hope to see you there! Come over & say hello! 1) To investigate the possibility of any of the archaeological consultancies no longer being able to continue in business? “We have already dealt with one major company which went out of business. 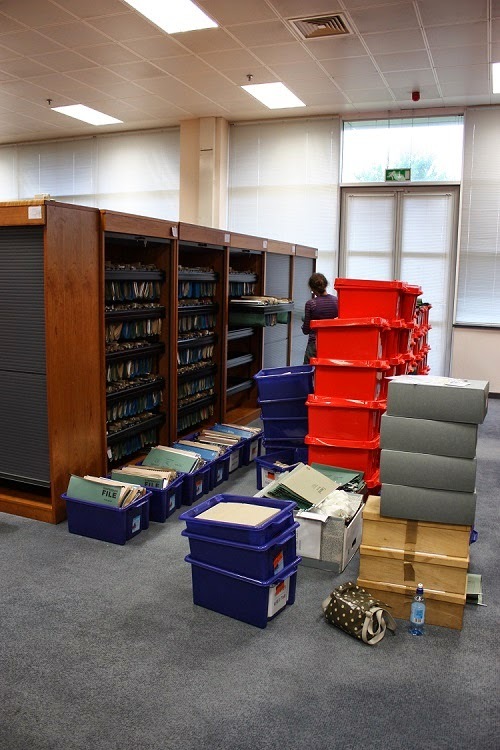 Although the finds are automatically the property of the state, there was no requirement for the deposition of the paper archives from excavations, as opposed to the reports, which were required as a licence condition. Our response has been to provide a database and the archival boxes for sites to anyone prepared to lodge their archive with us. This has elicited a good response from excavators as there are three advantages for them. The first is that it is something that most of them want to do for professional reasons. The second is that it involves only the expense of doing the work, as all other aspects (including transport), are covered by us. The third is that it means that they no longer have to pay for warehousing the material. So far we had the initial company who did their best to send us their archive even though they were in the throes of selling their headquarters and letting staff go. What they sent us was not perfect, but we have their entire archive. 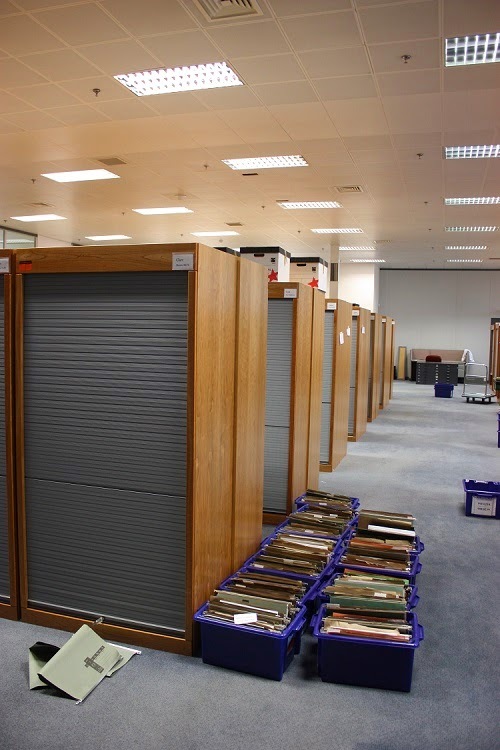 The Dublin material was sent to Dublin City Archives and they have already archived much of it. At the moment we do not have the staff to do this but the material is relatively well organised and we will get around to it eventually. Since then with the provision of boxes, database etc., we have much better quality control in place. The process works like this. 1. The person is given the box size and the database and a document explaining how we wish the material to be presented. They estimate the number of boxes required. They can also send us their plans in folders or in rolls. 2. We visit them at their place of work with the boxes and explain the system again. 3. They archive the material using the database which also produces box lists, box labels etc. 4. We visit them and check at least 10% of the boxes. If we discover significant errors we go away and they have to fix the problem. If no significant errors are manifest we arrange for the archive to be transferred to Swords. 5. We shelve the material in Swords and there is an automatic upload which allows us to add the data to our database en masse. 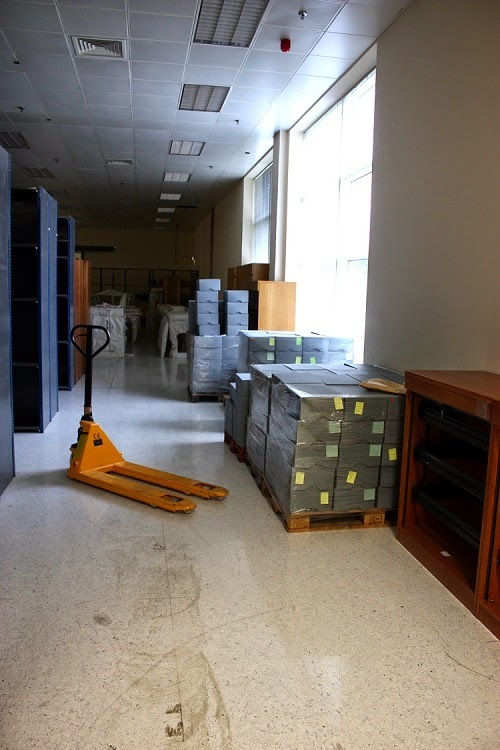 The reason we dealt with this problem using this method, is that when we started, the Archive Unit had three staff under my direction and three other main strands of archived material. Even then we knew we would need a semi-automated system and that staffing would become an issue. 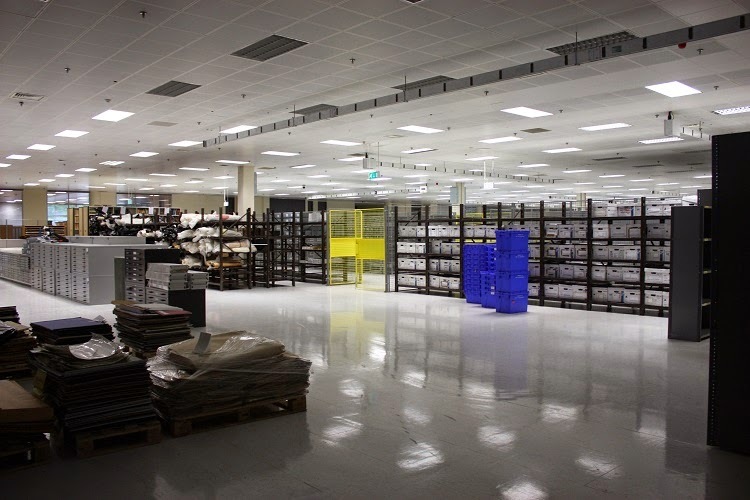 Without going into too much detail, we have had companies which are still in business on a smaller scale but who needed to downsize (hate that word) both in terms of staff and office and warehouse space. Other companies were in a position where the directors felt that they were likely to go out of business but still had enough to pay a skeleton staff to archive the material. 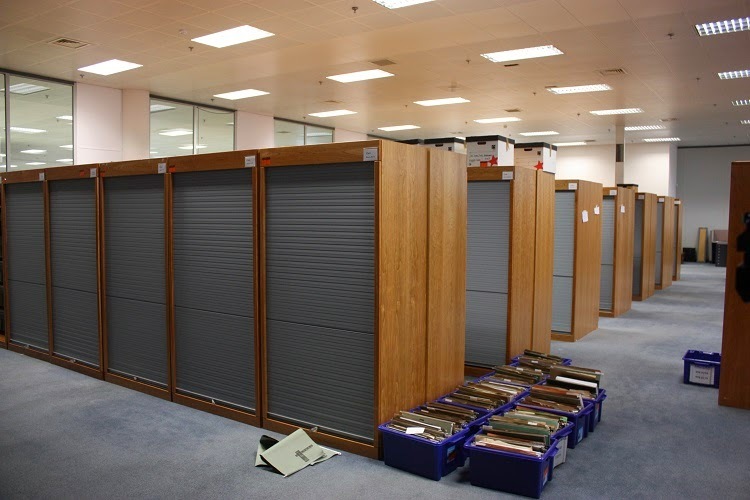 We have also had cases where licence holders went back into a company office and archived their own excavations. There is a strange mix of altruism and money sense going on, but so far, we are not yet aware of any company abandoning their archive without telling us. Because the deposition of the paper archive is not yet a requirement under law, there is a possibility of someone doing this. The law is unlikely to be retrospective when and if the Bill is passed into law, so to a certain extent we are dependent on the professionalism, money sense and altruism (in some cases) of the companies and the individual licence holders. In one case that I am aware of the Developer made it a requirement of paying for a pair of licences that the report should be written and that both the NMI and ourselves should have accepted the finds and the archive. The first point that I would make is that the NMS are to be congratulated for taking these proactive steps, especially in such financially difficult times. Obviously, there are significant differences in the legislative frameworks in the two jurisdictions. In the Republic of Ireland archaeological artefacts are the property of the state, while in Northern Ireland they belong to the landowner. If that landowner, say a large construction firm, has no appreciation of the cultural significance of the materials in their possession, they are wholly within their rights to dispose of it as they wish. They could, in theory, offer these pieces to local museums, private individuals, or simply put them out with the rest of the rubbish for the bin men to collect … whatever’s easiest! The NIEA appear to have relied for many years on the good will of the archaeological companies to house and curate this material. Now that the volume of archaeological artefacts is reaching/has reached crisis point, coupled with the financial difficulties that many of these private enterprises appear to be in, the potential for the loss of these archives is significant. As I have said on a number of previous occasions, one archaeological consultancy – apparently acting legally, if immorally – is believed to have returned entire archaeological archives from a series of significant excavations to the developers who paid for the excavations. Even with the most willing suspensions of disbelief, I find it difficult to imagine that any of this material will ever be seen by professional archaeologists or students again … unless someone excavates a section through a Northern Irish landfill site at some time in the future. 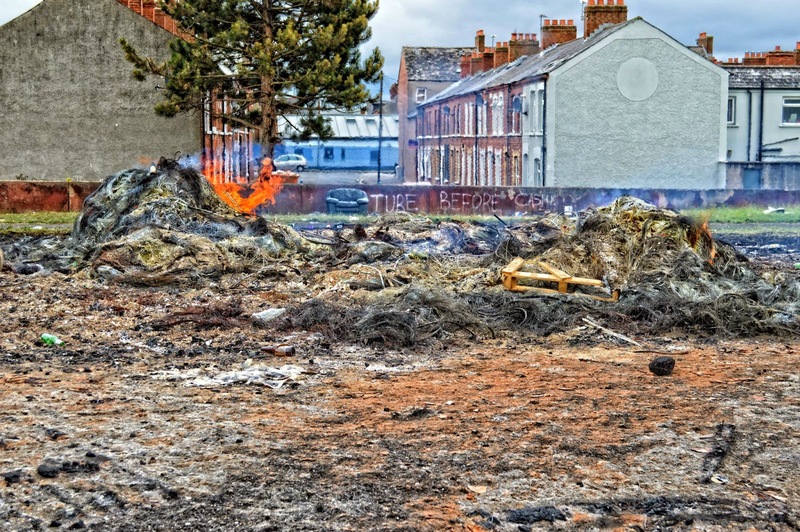 This devastation of Northern Ireland’s excavated heritage is already underway and – unless rapid changes are put in place – is only set to continue. This is all well and good, but there is still no actual process in place to manage these archives and no means or regulating the commercial archaeological sector to prevent them from disposing of significant cultural assets and having them pass beyond all form or curation and scholarly access. Similarly, there is no safety net in place to rescue this material if one or more of these companies are unable to continue in business. I don’t want to be seen as especially taking the hammer to O’Keeffe and his colleagues, but the time for this initiative to have kicked off was several years sooner than it has. Had something like the NMS’s scheme been in place even three years ago (2011) it could have saved a consultancy in serious financial trouble from disposing of large quantities of our shared archaeological assets. Even if they are arriving late to the party, O’Keeffe and the NIEA are to be commended for at least addressing the issue. For too long it has been one of those ‘somebody should do something’ problems that only ever generated sighs of resignation and wringing of hands, but no actual action. At least now there is cause for some hope and some action. However, until such time as the hope manifests in real, physical action we will continue to see material – artefacts and archives that should be considered as publicly owned cultural assets – quietly disappear from the warehouses and offices, never to be seen again. 1) Murals by ‘themuns’ – they’re sectarian, they’re ugly, they glorifying terrorism, and they’re probably not particularly well made … which, quite frankly, is all you can expect from a bunch of savages like that! 2) Murals by ‘usuns’ – they proudly display our beautiful, inclusive culture and commemorate our fallen freedom fighters. They are genuine works of art that are far superior to the disgusting daubs perpetrated by ‘themuns’. You can see some examples of both from my own collection, taken in 2002: here. 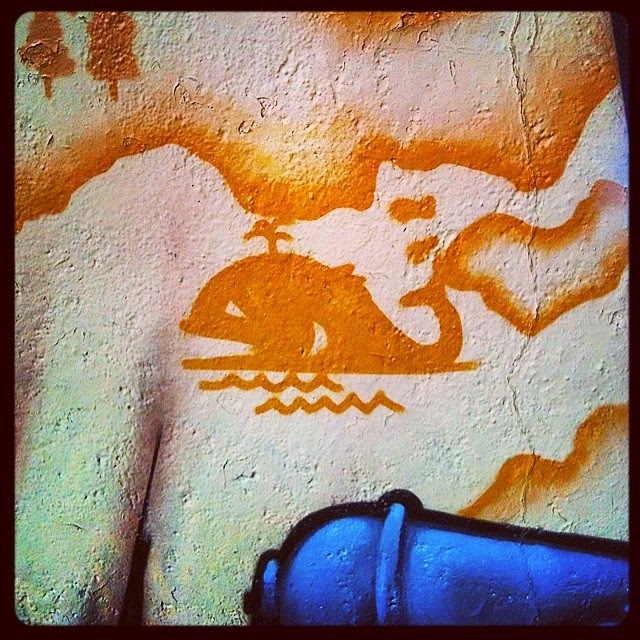 However, there’s a third group of murals that no one really seems to know what to do with. The Wiki article calls them ‘other’, while the Belfast Murals site allows you to filter your search by ‘Social/Cultural Murals’. If it’s not obviously about themuns or usuns, it appears that we are unable or unwilling to process it. A little while ago, I wrote a brief piece for this blog about the 2014 Game of Thrones Exhibition in Belfast. My theme at that time was that, although it was a selection of the costumes and props on display (beautiful as they are), it was the Northern Irish landscape and a number of our heritage sites used in the filming that were of more interest to me. Then as now, I’d suggest that if you are planning a holiday to these parts, you could do so much worse than adding some of these places to your itinerary. Obviously, the filming of this series in Northern Ireland has had a very positive impact on our economy, with literally millions of pounds being spent here by the production crew. It has also been a boon for unshaven, long-haired, and generally unkempt men that are suddenly welcomed with open arms as multitudes of well-paid extras (you know who you are!). What I hadn’t realised at the time was how much the idea of the books and TV series have sunk into the wider consciousness. The Wiki article referred to above describes the Northern Irish murals as ‘a mirror of political change’. I would only amend that to add that it can also act as a barometer for broader cultural change too. 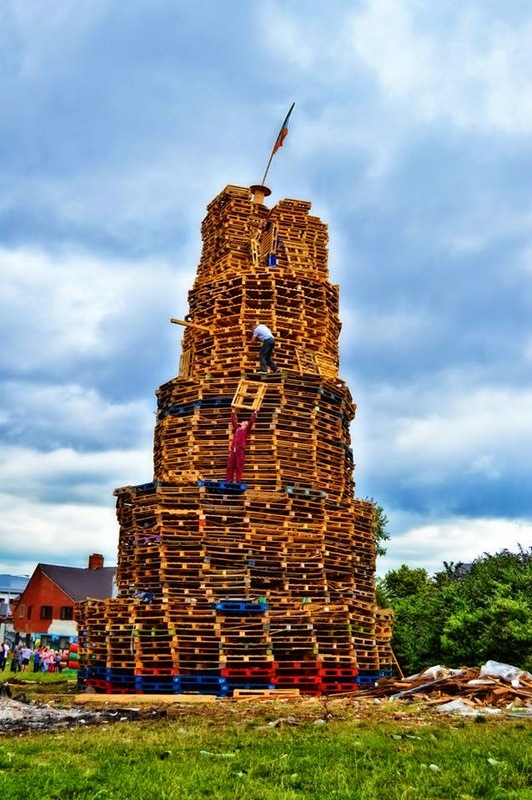 In 2014, when some folks were building a giant bonfire to celebrate the 12th of July on the Comber Greenway in East Belfast, someone was doing something completely different right beside them. This is a large-scale mural celebration of Game of Thrones. It uses iconic images from the series (the Iron Throne of the Seven Kingdoms of Westeros; Jon Snow’s white Direwolf, Ghost; and one of Daenerys Targaryen’s dragons) all set against a flowing, and somewhat frayed, map of the GoT universe, itself on a black background. As far as I can tell, the geographical names (e.g. 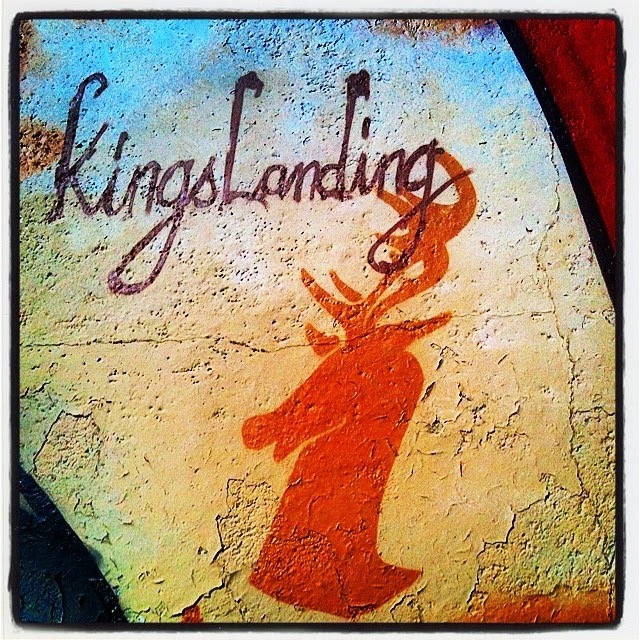 Qarth, King’s Landing, Storm’s End, Riverrun, etc.) are added in, if not quite at random, then to create a balanced and pleasing image, as opposed to remaining true to the ‘real’ geography of the GoT world - though they are most certainly poorly punctuated. 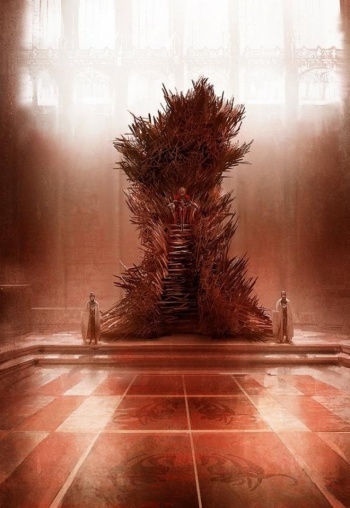 One visual element that initially caught me out was the manner of the depiction of the Iron Throne itself. The version known on the TV series, and from the books, is a very, sharp, spiky affair, known to draw blood from its incumbents. However, this version was all cylinders and rounded ends … I initially interpreted them as artillery cannon and thought there was some deeper militaristic or political message being communicated. It was only a little while later that I realised that they were actually the type of aerosol spray cans used to create this work. If anything – my lack of cultural savvy, aside – this must reinforce the distance between this and the ‘traditional’ sectarian and political murals. Instead, it is much more a part of the contemporary graffiti and street art movements, more influenced by hip hop music than ‘drum and fife’. Some of the locals of east Belfast may still engage in sickening racist attacks, but scenes like this give some hope that we’re moving away from a narrow, provincial world view to one that’s wider, brighter and more accepting of external cultural influences. Long may they paint! In the final section, I just wanted to add a few details of the mural, emphasising as much the image as the texture of the wall on which it is painted – partially flaked, with lumps, bumps and scores in the concrete … it has been home to numerous murals in the past and will, I am sure, be again in the future ... I'm just pausing for a moment to record this layer! Well, I thought it was interesting!